NEW YORK—Celebrities, government officials, and philanthropists celebrated at Pier 57 to raise money for the Hudson River Park Trust on Thursday night. Actor, Hugh Jackman and his wife, Deborra-Lee Furness; business magnet, Martha Stewart; actor, Denis Leary; actress, Brooke Shields; comedienne, Sandra Bernhard; NYC Mayor, Michael Bloomberg; and others were there. “We’re there every day,” Jackman said. He visits the park with his kids, takes their dog for a walk, goes kayaking and fishing. “Our kids go over there and volunteer, help work on the ground,” said Furness. The Friends of the Hudson River Park Gala at Pier 57 helped raise funds for the construction of the future cultural and community hub. It still hasn’t been rebuilt since Hurricane Sandy last year. The organization depends solely on the donations and support of philanthropists and honorees. “It’s great, everybody here is involved, no one is being dragged here because they have a friend. 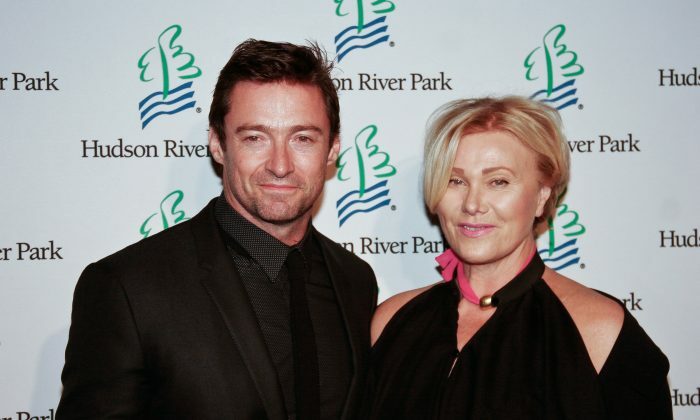 Everyone is here to have a good time and raise money,” Jackman said. “I think they’re handing out spades at the end, so we can all go and do some digging,” his wife said. Celebrities came into the reclaimed pier space with its concrete floors and yellow lighting and mingled at the urban-styled bar stands. “My kids have grown up using this park … I think it’s a really important park in the neighborhood. I really enjoy it,” said writer and actor Denis Leary. Jackman was the host at the show, while Leary was a featured guest. Honorary Co-Chairs of the trust are Julianne Moore and Bart Freundlich. The Hudson River Park Trust was established in 1998 with the goal of planning and managing the longest waterfront park in the U.S.
To see full photo gallery of the event check out EpochSnaps Galleries: Friends of Hudson River Park GALA.